– REPL: Connecting to your PC via USB, the board appears as a USB virtual comms port (CDC VCP) and you can use any serial program to connect and get a Python REPL prompt. This allows you to instantly type and execute Python commands, just like you would when running Python on your PC. You can also redirect the REPL to any of the UARTs on the pyboard. – Remote script: You can change from REPL to raw REPL mode by sending ctrl-A, and then in raw REPL mode you can send an arbitrary Python script to the board for it to execute immediately. A Python script is available which makes using this mode very simple: you just run python pyboard.py script_to_run.py and this will execute script_to_run.py on the pyboard, returning any output. – From file: The pyboard has a small, built-in filesystem which lives in external flash memory. It also has an SD card slot if you want to extend the available storage. 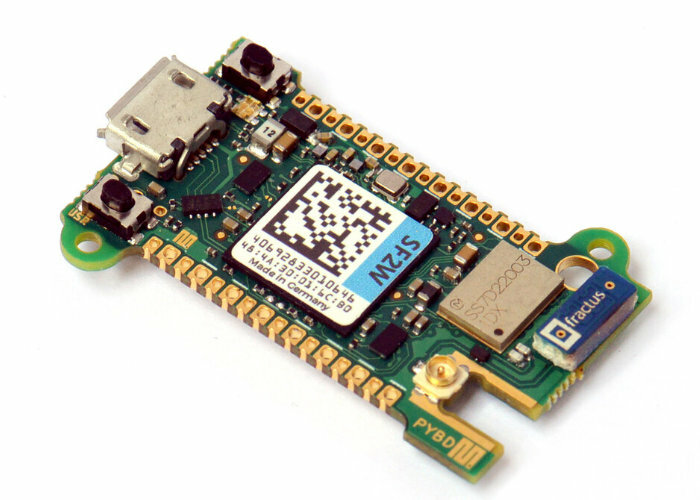 When you connect the pyboard to your PC, it appears as a USB flash storage device and you can access (mount) the internal filesystem and the SD card this way. If you copy a Python script to the filesystem and call it main.py then the board will execute this script when it starts up. This way you can run scripts without being connected to a PC. Scripts can also be pre-compiled to Python bytecode (so-called .mpy files) to enable faster loading at runtime. – Via frozen code: Once an application has been developed it can be pre-compiled and frozen into the main firmware. This gives minimal overhead for RAM usage and start-up time. This is an advanced feature and requires you to recompile the C-based firmware. 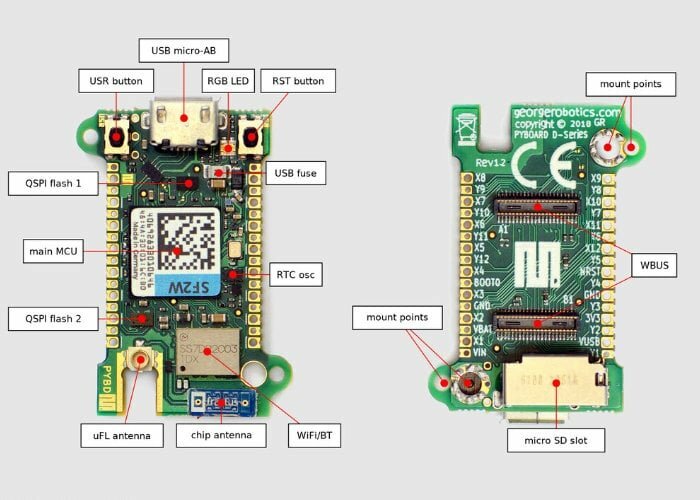 For more information and full specifications jump over to the MicroPython online store by following the link.